One of the most challenging parts of gardening is keeping your garden weed free. Every time you turn your back, it seems like weeds spring up out of nowhere. 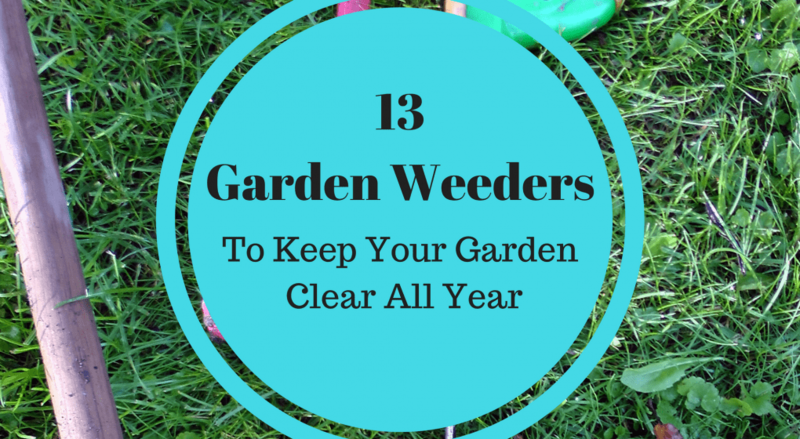 Thankfully, there are many types of weeders you can use to keep your weeds in check and have a thriving garden. The type of garden weeder you select should be based on the type of garden you have and your own personal preference. If you find a weeder that you’re comfortable using, you’re more likely to take the time to keep your garden weed free. There are a number of weeding tools on the market, but here are some tried and true favorites. This weeder is the Cadillac of weeders. It’s designed with the user’s comfort in mind. It has a long shaft to prevent you from having to stoop over or kneel and the handle is designed to help you have a solid grip - without straining your wrist. It has four powerful claws that easily destroy dandelions and other invasive weeds. The CobraHead weeder comes in two sizes - original, which features a long handle, and the mini - which has a smaller handle. The short handle on the mini CobraHead weeder is often preferred over the orignal because it’s lighter and can get into tight spaces. But both types of weeders are very similar. The mini CobraHead is generally used as a weeder in grassy areas or in container gardens. It’s designed to be used by right or left handers, and with it’s heavy duty handle, you’re bound to comfortably remove weeds - easily. My Grandpa used a screwdriver to dig up the weeds that grew in his front yard, but Grandpa’s Weeder is definitely a more effective tool. It made its debut in 1913 and has been a favorite among gardeners ever since. It has a long handle so you can easily stand and remove weeds, making it great for people with back or knee problems. It’s designed so you can easily remove weeds by using a simple lever instead of your body weight. The Yard Butler is another tried and true garden weeder. Developed after WWII, this easy to use long-handle weeder features a foot pedal to use to grab weeds. You can use a rocking motion with the pedal to get especially difficult weeds out of the ground. There’s also an ejector button to help you easily dispose of a weed once you capture it. 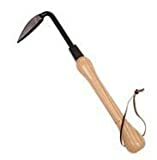 Hand weeders are known for their strength and durability. They have short handles that aren’t prone to bend when removing hardy weeds with thick roots. Designed with stainless steel, hand weeders can be used to remove weeds for years on end without any damage to the weeder. 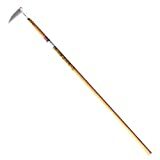 Also known as a Hula Hoe or oscillating hoe, this super durable long handled weeder features a fiberglass handle and steel head.It features a sharpened blade edge to easily dig into the ground and loosen soil or cut weeds off at ground surface level. This weeder definitely requires some arm strength to get the job done and is better suited to someone who doesn’t mind physical labor. But, as an added bonus, it can be used to turn over dirt in your garden or compost pile. Featuring a long handle and a very sharp edge, the long handed garden hoe can be used to cut through weeds and soil. It’s a great option to use in raised beds or to break up soil before planting. Loosening soil and weeding can be a breeze with the rotary garden cultivator. It features removable blades so you can till in small spaces or around plants. Its adjustable handle allows you to till in hard to reach corners without straining your back. 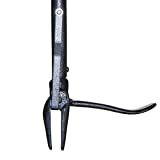 Built tough, the Cape Cod weeder can be used in rocky areas - like the Cape Cod - to dig holes or dig up weeds. No matter where you live, it can be used to loosen soil around plants without causing strain on your hands, making it a great tool for people with arthritis. Weeds that grow in cracks in between pavement or sidewalks can be hard to get rid of, but a paving weeder’s strong knife-like design makes weeding in tight spots a breeze. The hooked blade easily pulls up weeds saving time and energy. A Hori Hori weeder has both a straight and serrated edge making it a versatile tool for removing different types of weeds. The sharp blade can cut through roots and remove weeds in the driest, toughest soil - including clay. Featuring both a wide blade and a narrow edge, the Hoe Dag can be used to remove weeds in wide or tight spaces. 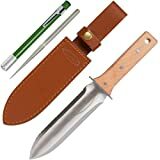 It has a carbon steel blade that’s easy to re-sharpen, and this tool is sturdy enough to last a lifetime. 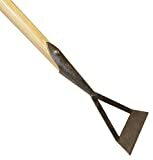 A Dutch Hoe can be used to cut weeds off just below the surface with a slight pushing motion. Unlike a traditional garden hoe, the Dutch Hoe has a long handle that allows you to stand up straight while removing weeds, putting less strain on your back. Don’t let weeds overtake your garden - try out one of these tools to see what works best for you. Roxanne O’Brien-Troke is a Cleveland based writer with a passion for all things natural and plant-based. As a self-proclaimed crazy cat lady and fitness enthusiast, she spends her free time volunteering at an animal shelter as a cat adoption coordinator, running, and going to spin classes.